As I walk, I step on scattered palm seeds. The palm trees tower above me. The seeds are tiny in comparison. Seeds are the promise of a future generation. I’ve thought a lot over the past few days about generations, of parents and children. How do actions of parents affect their children? There are many way parents affect their kids. I’m a carrier of multi-generational family habits, including an obsessive love of watermelon, corn on the cob, and homemade bread. I have a Bushman nose and the Noble laugh. But, I’ve been pondering how parents’ choices affect their children. Parents dictate their home’s atmosphere. Is education promoted? Are recreational activities a priority? Does the family do things together? Is the home full of fear and violence or love and laughter? It’s actually easier to see the effects parents’ choices have on their kids than I thought it would be. Teenagers with parents who smoke are 10 times more likely to smoke as well. A couple’s divorce affects their children in various ways. A parent’s illiteracy creates social vulnerability for his children. The foster care system exists primarily to offset the effect of parents’ choices on their children. Society has created ways to hold parents accountable for their really bad choices and help kids cope/deal with negative effects. Some choices, whether positive or negative, effect generations. What about spiritually? How do parents’ decisions affect children? I’m the product of generations of very religious folk. They sought truth, found it, and then sacrificed everything they had– including their lives– for it. When I face challenges, I remember their stories and find strength to do hard things. As I went to the scriptures, I noticed the blessings of righteous parents to their children. And then, I started really noticing prophecies of judgment passing from parent to child. Does God really pass judgment for sins from parent to child? Yes. After Moses broke the original stone tablets, he took another set for the Lord to write upon. The Lord descended in a cloud, and Moses worshipped Him. “Keeping mercy for thousands, forgiving iniquity and transgression and sin, and that will by no means clear the guilty; visiting the iniquity of the fathers upon the children, and upon the children’s children, unto the third and to the fourth generation” (Exodus 34:7). thousands of them that love me and keep my commandments” (Mosiah 13:13-14). Missouri’s Extermination Order caused the Saints to flee that state and settle in Nauvoo, Illinois. The Lord rescinded His commandments for the Saints to build a temple in Jackson County, Missouri, because of the violent persecution that caused them to flee. “And I will answer judgment, wrath, and indignation, wailing, and anguish, and gnashing of teeth upon their heads, unto the third and fourth generation, so long as they repent not, and hate me, saith the Lord your God” (Doctrine and Covenants 124:52). “Unto the third and fourth generation” seems pretty specific. And significant. So, these seem like kind of general warnings. But, did the ancient people really consider these ominous words possible? Yes. As he prepared to die, Lehi blessed the children of his rebellious sons. He said that he knew if they were taught correct principles, they would follow righteously. But, he knew they weren’t going to be taught truth. This is so tender to me. Lehi has seen the effects wickedness will have on his posterity. He’s also seen how righteousness could affect them eternally. “Wherefore, if ye are cursed, behold, I leave my blessing upon you, that the cursing may be taken from you and be answered upon the heads of your parents” (2 Nephi 4:6). Were Laman, Lemuel, and their wives offended by Lehi’s words? I’ve always wondered that. King Hezekiah showed Babylonian visitors all of Israel’s treasures. Isaiah asked him what he was thinking. Hezekiah didn’t seem to find anything wrong with his decision. Isaiah then prophesied the Babylonian conquest. “Good is the word of the Lord which thou has spoken. He said moreover, For there shall be peace and truth in my days” (Isaiah 39-6-8). And indeed, all of the wealth Hezekiah revealed to Babylon, ended up in Babylon. Israel’s captivity lasted 70 years. About 3 or 4 generations. So, parents’ spiritual choices can, and do, affect their children. The scriptures are full of example after example. Unless we repent, each of us pays the price for our own sins. But, we can feel the effects of decisions made generations before us. Maybe this is one reason why the hearts of fathers and children are turned to each other. As we see and recognize legacies of wickedness or “false traditions of our fathers” (even things like short tempers and gossiping), we can consciously choose to follow the Lord. If needed, we can be the point of change in our families. 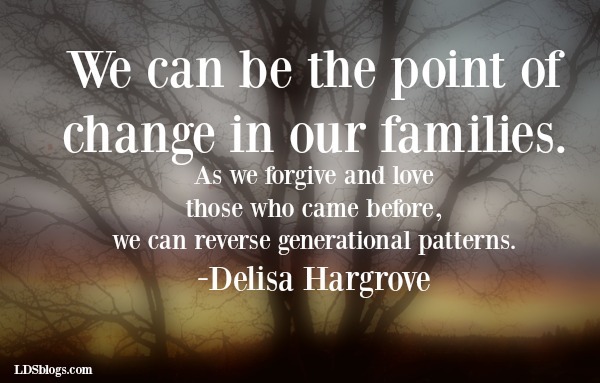 As we forgive and love those who came before, we can reverse generational patterns. The converse is also true. We can recognize and then rely on the strength, courage, and conviction of our ancestors who paved paths of righteousness. We can celebrate determination, curiosity, and endurance. I need to spend more time honoring and celebrating my ancestors. Some ancestors knew the consequences that their choices would have on future generations. Lehi’s recounted the prophecies of the ancient Joseph. Nephi wrote that “he truly prophesied concerning all his seed….And he prophesied concerning us, and our future generations” (2 Nephi 4:2). Mary knew that “henceforth all generations shall call me blessed.… And his mercy is on them that fear him from generation to generation” (Luke 1:48-50). She is an example of a life worth studying, celebrating, and emulating. So here I am, and you are, today, at a pivot point between generations past and present. We make covenants to bind ourselves to those past and future. We link our families together. The sealing power has eternal consequences. During his 1929 General Conference address, Elder Orson F. Whitney bore witness to the effect of an eternal sealing. “The Prophet Joseph Smith declared—and he never taught more comforting doctrine—that the eternal sealings of faithful parents and the divine promises made to them for valiant service in the Cause of Truth, would save not only themselves, but likewise their posterity. Though some of the sheep may wander, the eye of the Shepherd is upon them, and sooner or later they will feel the tentacles of Divine Providence reaching out after them and drawing them back to the fold. Either in this life or the life to come, they will return. They will have to pay their debt to justice; they will suffer for their sins; and may tread a thorny path; but if it leads them at last, like the penitent Prodigal, to a loving and forgiving father’s heart and home, the painful experience will not have been in vain. How merciful is our God? Wrongs can be righted. Rights can be perpetuated. Through the precious sealing power, we are united and bound for eternity. We are affecting past and present generations by how we choose to live today. What a great and glorious and overwhelming cause. And in answer to prayers of those, in the past, for us, the Lord promises “I will be on your right hand and on your left, and my Spirit shall be in your hearts, and mine angels round about you, to bear you up” (Doctrine and Covenants 84:88).